Is this set by Blenko? Topic: Is this set by Blenko? I have this red ashtray and lighter set that I think is by Blenko but could use some confirmation if anyone recognizes it. The ashtray features controlled bubbles, four folded in cigarette rests. I've seen a lot of similar lighters but not many of the ashtrays/bowls. Yes, they are Blenko. The lighter is Tangerine and designed by Joel Myers design #6320. The ashtray is most likely Tangerine too, but I'd need more pictures of it to tell for sure. Could you please add the measurements of the items because Blenko made things in different sizes and that makes a difference for the item numbers. The lighter is about 7" in diameter and the lighter is approximately 4". The ashtray is of much thicker glass than the lighter and so, even in bright light, I can't see the variation in color that I can in the lighter. Blenko's tangerine color can be as different as day and night. A lot of it looks like amberina but their tangerine color can be all orange, dark orange, yellow with a bit of orange and even look red like ruby. Here are a few examples of different shades of Blenko's tangerine. 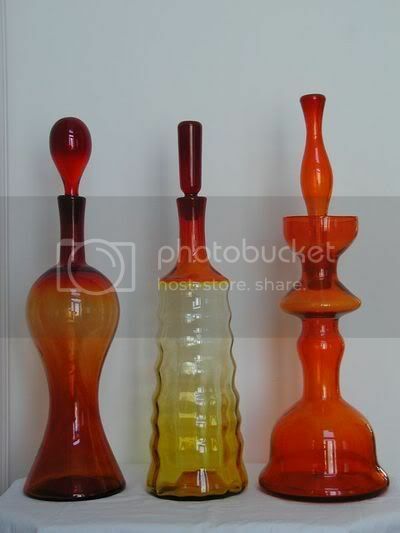 The thicker glass like your ashtray can look like ruby but it could indeed be tangerine. I guess I'd always equated Blenko's Tangerine with "amberina" but your pictures cleared that up for me as did many of the lovely pieces on your website. Do you think this set was probably made in the 60's? 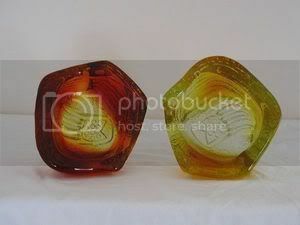 A ballpark figure for valuation would be extremely helpful too should I decide to sell as I don't know much about Blenko glass. Well, the ashtrays really don't do well because their so common. Other makers like Erickson and Bischoff made them too and sometimes it difficult to tell who made them. The lighters do better and right now I have one up for auction on ebay. You can check on it and see what it goes off at.